So, you want to start your blogging journey and looking for the best web hosting in Pakistan as well as domain registrar? OR planning to launch a website for online business, shopping store, personal branding, or anything else. Web hosting and domain name both are the primary elements to build any type of website. Your domain name is an online address whereas web hosting is the place which stores all the site content. So anyone can access it all around the world anytime. Now, the essential thing is you should choose a reliable web hosting which provides acceptable uptime (like 99.9%), fast loading speed, and pro-active customer support for help anytime when an incredible. There are various web hosting companies in Pakistan to get cheap and affordable web storage. Now without further ado, let’s discuss some of the web hosting providers in Pakistan to get affordable, reliable, and cheap hosting. There are more than 5 providers but I am not going to mention each and everyone on this list. My choosing criteria is pretty simple. I picked ones who are in business for years, at least for 2 years, liked by real users (reviews), offer customer support via multiple ways, and 99% uptime guarantee. 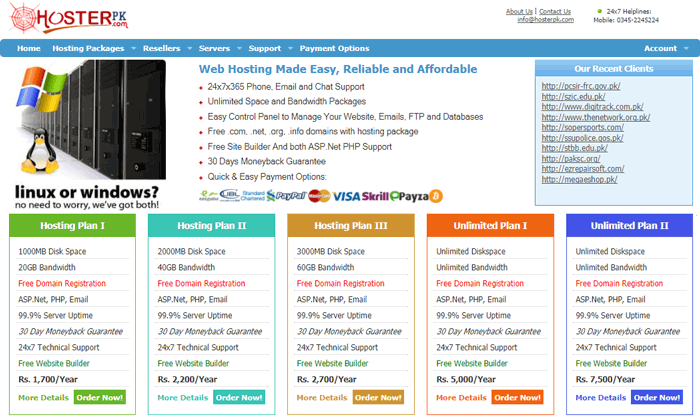 HostperPk is one of the most popular and well-known hosting company in Pakistan, it was founded in 2009. Due to outstanding and reliable services they manage to get their position in top 3 web hosts in Pakistan. You can buy most affordable and cheapest hosting plans under $20 per year to build small projects. HosterPk offer Joomla, PHP, ASP.net, Linux, Windows, Dedicated, and WordPress hosting to fulfill all users need. Besides lowest web hosting plans, they also provide domain name registration services at the very reasonable prices. They offer domain registration in Pakistan at the cost of just Rs. 1000/year (almost $10) for .com, .net, and .org. The best part is renewal rates are also the same. You might know that most of the companies charge more money at the time of renewal. You can contact the support any time through the phone call and email. They give a FREE domain name with all plans which is an awesome deal. All plans also include 30 days money back guarantee, unlimited bandwidth, Raid 10 protection, and 99.9% website uptime. HosterPk allows purchasing through multiple methods such as EasyPaisa, PayPal, Visa, MasterCard, Standard Chartered Bank, URL Bank, Skrill, Payza, and Bitcoin. NavicoSoft is another great web hosting provider in Pakistan to help you create your website within budget. They are managing more than 5k customers all around the globe. Due to outstanding services, reliability, and use of cutting-edge technologies many small to mid-level business use their web services. NavicoSoft is also known as one of the top 5 web hosting companies in the country. They have a wide range of web solutions such as domain registration, shared, dedicated, and VPS hosting. All plans come at the reasonable and cheap prices, for instance, you can buy the entry-level Linux shared plan under $15 per year with 2 GB disk space, 40 GB bandwidth and a free domain name. There is also Windows based packages available. They have a dedicated and expert customer support team to help you anytime when you need help via live chat, support tickets, and phone call. Their support team will try to fix your issues within no time. PayPal, Credit Card, and Bank Transfer are the primary payment gateways offered by NavicoSoft. Are you looking for a web hosting companies with having years of experience, cheap hosting solutions, and 24/7 customer support then choose Nexus. It was founded back in 1999. There you can grab most inexpensive plans to host individual and small websites. No doubt, their packages are cheaper than any other company in Pakistan, but you have to purchase the domain separately. Yes, Nexus doesn’t offer free domain name with any web hosting package. If you browse their website, you will know that they have a bunch of services ranging from domain name registration, shared, dedicated, cloud web hosting, SSL certificate to web development packages. All the web hosting plans empowered by US data centers with 99.5% uptime guarantee and FREE site migration. Nexus also provides the Pakistani-based hosting solution for Linux and Windows users at the reasonable rates. For instant help, they have a huge knowledge base section to find solutions for problems you might face. You can contact them via live chat, support ticket, and phone call but keep in mind live chat is available only for specific hours. Paypal, UBL Bank, MasterCard, AmericanExpress, and Visa card are the payment methods using which the users can buy Nexus services. WebSouls is in this business for more than a decade and serving customers all around the world. It is a leading Lahore based web hosting provider in Pakistan where you can register your domain at the industry standard rates. You get a powerful and user friendly domain management control panel to change NS records, forward email and edit DNS records. WebSouls have an enormous amount of TLD extensions to choose from. Regarding hosting solutions, their web storage plans are quite similar to other brands in this list. You can subscribe to entry level package just at RS. 1700/year or $17/year with 1 GB of space, 100 GB bandwidth, email forwarding, and spam protection. Like many web hosts in this field, they also offer a free .com, .org, and .net domain extensions along with each plan. When we talk about other storage solutions, VPS cost you Rs. 699/mo, Dedicated Rs. 6999/mo, and SSD based VPS at Rs. 2499/mo. All of their plans compatible to install major CMS including WordPres, Joomla, Drupal, ZenCart, and Magento. They monitor your websites actively to fix or discover any issue which may occur in the near future. So, they take necessary steps to prevent downtimes and technical server issues. One-click scripts come not only handy to install major CMS but also help non-techy users to save a lot of time. They are in business for more than 14 years and providing hosting solution for small, medium, big websites, and web developers to achieve their goals. It was established back in 2001 and now managing more 5k+ clients, 8.5k sites, and 50k+ domain names. CreativeON has customers from more than 80 countries which show that they utterly deliver what they claim. They are authorized NOC partner with cPanel, CloudLinux, WHM, and WHMCS. CreativeOn provides hosting resources for all users including shared, VPS, dedicated, reseller, and cloud hosting along with domain registration services. Now, they are managing more than 50,000 domains on their platform. You can buy SSL certificates through various companies like RapidSSL, VeriSign SSL, GeoTrust SSL, Comodo SSL, Thawte SSL, and Trustwave SSL. You can get online just at RS. 1200/year (almost $12) with a free domain name, 1 GB storage, and 5 GB monthly bandwidth in Budget-1 plan. However, for more resources (bandwidth, storage, email accounts) there are higher plans also available. But for small and starter websites, Budget-1 and Budget-2 package would be a good choice. You can upgrade when your website starts getting huge traffic. The standard cPanel to manage your hosting account comes with all the essential features including creating MYSQL databases, phpmyAdmin, PHP 4, PHP5, FTP accounts, Email accounts, Stats, Manual backups, and much more. A dedicated domain panel allows you DNS records modification, domain parking, redirections, WHOIS changing, and MX records alteration. CreativeON claims to deliver an unbelievable 100% uptime guarantee for business and WordPress hosting. They also weekly scan your websites for malware and remove any infected data without demanding extra cost. Another good news is all of their web hosting plans backed by 100 days money back guarantee. You can give them a try to check if they really worth your money. Budget, WordPress, and Business hosting plans have a small storage limit. Budget-1 comes with only 1 GB, some users may face issues. Here keep in mind, it’s the cheapest web hosting plan. Budget-1 don’t allow any database even a single one. So, you cannot install WordPress or any CMS which require a database. You might say there are why only five companies? Well, I just shared most famous and well reputed web hosts in Pakistan to help you find the right one which fulfills all of your website hosting requirement. You can choose any from above list to get started right now without further search as almost all the provider setup your account instantly. If you’re looking for highly stable, cheap, affordable, and 99.99% server uptime, then feel free to check BlueHost. It is one of the WordPress.org’s recommended hosting and listed on their official website to create a WordPress powered site. I am using BlueHost for one of my website and pretty satisfied with performance as well uptime. Now its time to finish this post here but if you know further web hosting in Pakistan that should be listed here then mention below in the comments.